Sylhan is able to produce any refractory or specialty metal component by working with our customers, addressing needs and specifications, identifying and sourcing the specified material and putting it all into production. Our expert team uses stringent manufacturing and quality disciplines that minimize scrap and help reduce product cost. Our experienced engineering team and highly skilled machinists will work with customers to ensure they receive the most effective, highest quality products at the lowest cost possible. Our leadership and manufacturing experience is unsurpassed in the industry. Our team welcomes challenges that other manufacturers have turned away. We pride ourselves on our ability to rise to the occasion when you come to us with your unique machining needs. We have MasterCam autoCAD and SolidWorks capabilities to accept most any file formats, and are able to digitize your drawings to create 3D models on the spot. Our team excels at research and development as we aim to build a partnership with your company and aid you in reaching your goals. Along with our renowned experience in the industry, customer satisfaction is our goal. Sylhan is reliable under pressure and commonly produces production and prototype parts within the most stringent timeline and quality requirements requested by our customers. It all stems from our motto that we make the impossible a reality. Certifications: AS-9100, EICC, ITAR and DDTC. Sylhan’s 22,000 square-foot plant in Edgewood, NY, located in the heart of Long Island’s industrial center, has a wide variety of state-of-the-art machining centers. 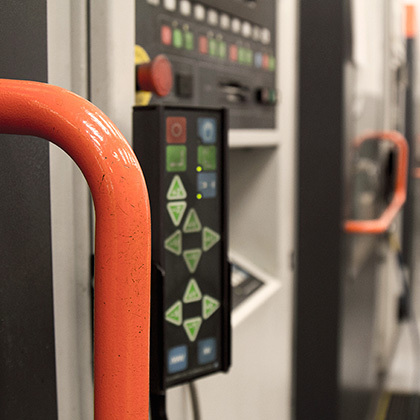 From CNC vertical and horizontal machining centers, five-axis capabilities and CNC screw machines to wire EDM and EDM sinkers, our investment in state-of-the-art equipment allows us to handle both low and high volume production. Our machining capabilities include, but are not limited to, milling, turning, grinding, electrical discharge machining, forming, welding, broaching, threading and custom assembly applications. While common machining practices for most, our ability to maintain exacting specifications with challenging-to-work-with refractory metals and other challenging metals truly differentiates Sylhan from the rest. Our experience in these areas is unsurpassed. To certify our quality products comply with our customers’ requirements, we employ a strong, experienced QA/Inspection Department and staging machines, and utilize smartscope flash CMM, Tesa Micro-Hite 3D CMM and a Niton XL-800 Alloy Analyzer.